I'm in a hurry. Jump to the recipe, please. Since the beginning of the year, I've been cleaning out my kitchen to make things organized, clean and fresh. It's something I highly recommend, and I try to do it every few months. If you're like me, you probably find a lot of odds and ends you forgot about when you clean out your freezer. Half a cup of mango with freezer burn. Overripe bananas you meant to bake into bread. Things you froze to avoid wasting... and end up having to throw away because you kept it too long. Maybe you even have some UFOs—unidentified frozen objects. I've gotten a little better about this over the last few years. This time around I did find a few things I wanted to get rid of to make room for new additions, so I've been planing ways to use them up. One of those things was bag of peas leftover from making vegetable soup. They were still good, but a little past their prime. I happened to have some pesto in the fridge and some sausage ravioli in the freezer, so I decided to make a pea pesto cream sauce. I'm gonna be honest with you here. It was SO much better than I thought it was going to be. Isn't it magical when that happens? It was rich and cheesy, but somehow bright and fresh. The basil and lemon juice gave the old peas new life. As much as I shout to the rooftops about homemade being best and unprocessed foods, I believe processed foods do have their place. One of the staples of my freezer is frozen pasta, and I love to pick up refrigerated pasta from the grocery store every once in a while. You can get shockingly good store bought ravioli and tortellini these days. Some of my favorite selections are at Earth Fare, Trader Joes, and sometimes Sam's Club. Even the store in my small town has a decent selection. I can think of few things that taste better than homemade pasta, and I still believe homemade is best... but making it takes time, counter space, and patience. I recommend you try it at some point. If you do, I think you'll realize it's not a mythical feat. That being said, I'm not here to judge you if you buy it pre-packaged. Refrigerated pasta with a close expiration date is a good sign, as it probably doesn't rely heavily on preservatives. The shorter the shelf-life, the more likely it is that valuable nutrients haven't been removed or altered to make them last longer. Read the packaging to see whether it mentions the use (or lack) of preservatives. Pasta made in-store or locally was likely made recently (maybe even that day) with high-quality, whole ingredients. The more minimally processed and less transport, the better. If it's made in small batches, even better. This suggests a person made it and that the recipe was created for quality, not manufactured for the masses. Check for standard nutrition information such as sodium and sugar content, as that can be a drawback of processed food. Pay attention to how many ingredients there are, and how many you don't recognize or can't pronounce. This isn't gospel, but the more there are, the more processed it probably is. Bonus points if the ingredients are local and don't include antibiotics or added hormones. Do it! Even if it doesn't meet the above criteria. Just don't eat it every night and you'll be fine. Being aware of what you're eating and making the best choices possible is great, but a bit of pre-made of pasta every once in a while isn't going to automatically give you cardiovascular/metabolic disease (or make you fat). Just be sensible. Don't overdo it or rely on it. When you eat it, don't feel guilty. Eat it slowly, savor every bite and appreciate it. 1. Warm a large sauté pan over medium heat. Add 1 Tablespoon of extra virgin olive oil and tilt the pan to coat the bottom. 2. Sauté the shallots and garlic until tender, about 3 minutes. 3. Add the peas, and continue sautéing for about 2 minutes. 4. Remove from heat and carefully transfer the mixture to a food processor using a large spoon or scraping spatula, removing as much as possible form the pan. Clean the pan and set aside. 5. Add basil pesto and lemon juice to the processor and pulse until well-mixed and creamy. 6. Add heavy cream to the pan and bring to a simmer over medium heat. 7. Add pesto and stir until evenly mixed. Bring back to a simmer and remove from heat. 1. Bring a large pot of salted water to a rolling boil over high heat. 2. Once the water comes to a boil, cook the ravioli until al dente, according to package instructions. 3. Warm a large pan over medium heat. Add the remaining extra virgin olive oil, and tilt to coat. 4. Spoon a few tablespoons of the sauce into the pan and stir it around in the oil. 5. Add the ravioli to the pan and toss gently to marry the pasta and sauce. Add the remaining pea pesto and grated cheese, and gently toss again. Remove from heat. 6. Serve immediately, garnished with more cheese and sliced cherry tomatoes. 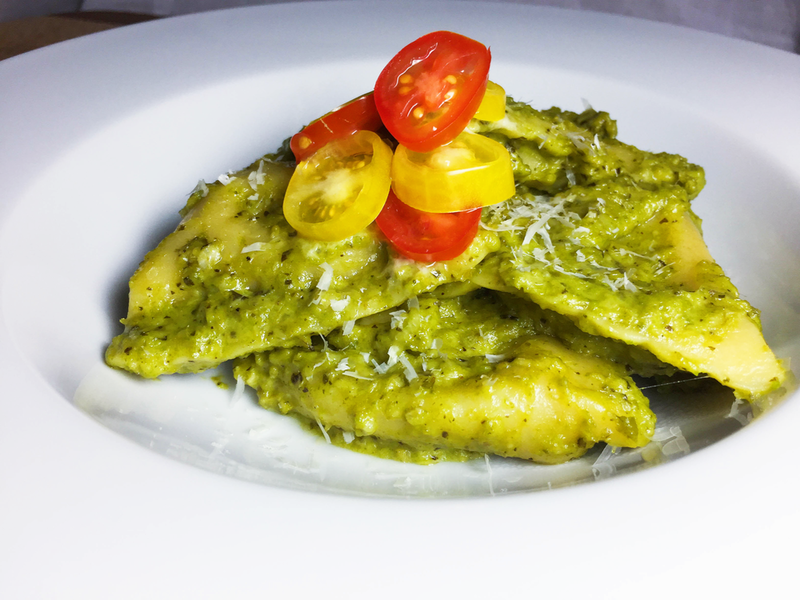 • Other flavors of ravioli would work as well, but the sausage pairs with the pesto so well. If you have another kind in your freezer, try it out! I think this would be great with any savory ravioli like chicken or cheese. • You could easily make this vegetarian by choosing a cheese-filled ravioli, and you could potentially even make it vegan. If you like to experiment, try out using coconut cream instead of heavy cream for the sauce and vegan ravioli (mushroom would be good!). For the parmesan cheese (in the pesto), you could experiment with nutritional yeast, ground cashews, garlic powder, lemon juice and I've even heard a spoonful of hummus can mimic the feel of parmesan in sauces. 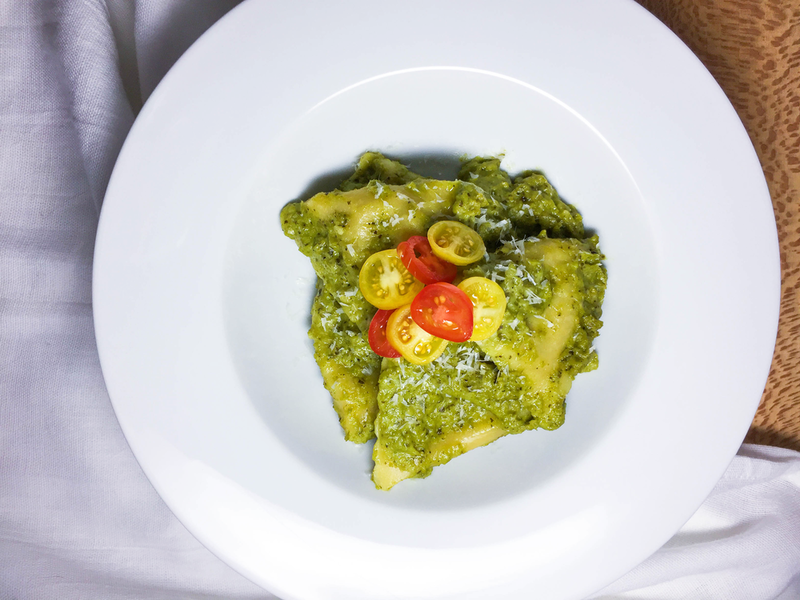 • If you wanted to just make pea pesto as a spread or for another recipe, you could just stop after step five. Shallots and extra garlic aren't necessary, but add to the overall flavor. Now that I've shared, it's your turn! Tell me what role processed foods play in your life. Do you try to stick to minimally processed or unprocessed foods? Do you not care either way? Is this something you think about? I'm so curious to know your thoughts, so let me know in the comments. If you make this dish, let me know! Leave a comment below, or post it on Instagram and mention @leanndacavalier and #whipsmartkitchen! I want to see you get cooking! Sign up with your email address to receive tips, updates and a freebie that will help you slay in your kitchen. You're in! Thanks for joining us. Now go check your inbox for your confirmation email! If you can't find it, try your spam folder. That little thief.